The water pump is a critical part of your car’s cooling system. If your car has a radiator, it has a water pump. The water pump creates the flow to push coolant through the engine to the radiator and back again. 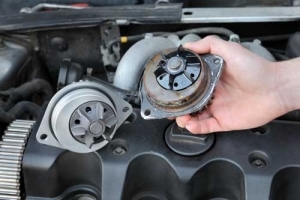 On most cars, the water pump turns from either a fan belt or the engine timing belt. If the pump stops turning, the coolant won’t move in the system. It remains in place, so the system can’t release the heat built up in the engine and transmission to the outside air. The water pump is also the only real moving part in the cooling system. So it’s the most likely part to wear, causing noises or leaks in the system. Depending on its location, replacing the water pump can be a quick, easy job or a large, difficult one. The most difficult — and most expensive — are usually the ones that are part of the timing belt pulley system. That’s because the technician has to remove the front of the engine and the timing belt to reach the pump. In most cases, you’ll want to replace the timing belt at the same time you’re having that type of water pump replaced. Whatever type of water pump your car or truck has, the technicians at your local Cottman center have the skills and the tools to make short work of replacing it. They’ll check the pump for bushing wear or damage, look for leaks from the pump vent, and let you know exactly what you’ll need to bring your car’s cooling system back to proper working condition. Is it time for water pump replacement? If you’re hearing noises from the front of your engine, or there’s a leak from that area, don’t wait: Give your nearby Cottman center a call and set up an appointment to have the system checked. They’ll evaluate your car’s cooling system and, if the pump needs replacement, they’ll give you the best price possible to get your car back on the road and running right.